A society unaware of its past is like a person with amnesia-- not knowing where it came from or where it's going. Ross's Trilogy is Canadiana, taking place almost entirely in Alberta. They are historical novels based on the MacIntosh family history - all of the names, places and incidents are factual but they are put into novel form, making them a mixture of fiction and non-fiction, or creative non-fiction, to bring the story to life. 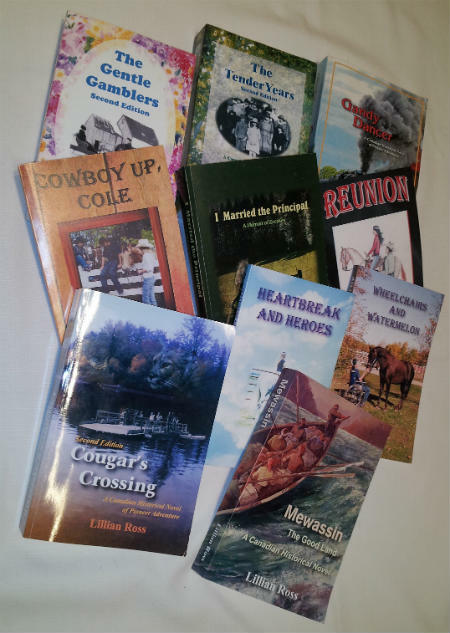 Newer books by Ross focus on the pioneer and historical adventures of the family of her husband, Reg Ross. Tuftin's horse series for young adults takes place in rural alberta. These exciting adventure stories teach as well as entertain. Lowry's Memoir is a first year teacher's experience in Darwell, a small rural Alberta community. The story also features farm life near Sangudo, Alberta in the 1950s.